New Ardbeg, Benromach & Bowmore From Edencrofts! Edencroft has 4 New additions to it’s range this week with whiskies from the Islay and Speyside regions. Namely some Ardbeg, Benromachand Bowmore brands. Summary: Lurking within is an Ardbeg of hidden depths. Extremely fierce charring of the cask gives Ardbeg Alligator a unique spicy bite that’ll catch you unawares. Charge your glass with a splash of water and roll it around and around in your jaws! Taste: Hot and spicy flavours grip you, ginger and chocolate thrash. Balance: to be honest, it was the end of another long day – and book – when I tasted this and I momentarily forgot the story behind the malt. My reaction one of my researchers who happened to be in the tasting room was: "Bloody hell! They are sending me kids. If this was any younger id just be getting a bag of grist!" This malt may be a fabulous concept. And Rollercoaster is a pretty apt description, as this is a dram which appears to have the whisky equivalent of Aspergers. So dont expect the kind of balance that sweeps you into a world only Ardbeg knows. This, frankly, is not for the Ardbeg purist or snob. But for those determinded to bisect the malt in all its forms and guises, it is the stuff of the most rampant hard-ons. Summary: Located on the outskirts of the ancient Royal Borough of Forres lies Benromach – Speysides smallest working distillery. Benromach – 30 Year Old: Matured in first fill and refill Sherry casks Benromach 30 Year Old is a rich, elegant Single Malt from Speyside’s smallest working distillery. Nose: Initial rum and raisin notes, with a delicate vanilla edge. Smooth peach and nectarine fruit flavours mingle beautifully with toasted malt. Palate: Hints of rich Sherried Christmas cake, with a touch of marzipan. Some mixed spices emerge. Smooth and creamy with mouth warming qualities. Cask Type(s): 1st fill and refill Sherry casks. Summary: Launched in 2012 this is the Bowmore 1985 Vintage, which follows in the footsteps of the previous 1980s Vintage series. Created from a unique combination of hand-selected sherry and bourbon casks, the expression is remarkably rich and fruity, balanced with the trademark Bowmore sea -salt tang, and possesses more smoke and depth than the earlier Vintage releases. This unique edition is a classic Bowmore; smoke, fresh Atlantic sea-salt and layers of fruit complexity. Presented in a wooden gift box with a weather-beaten brown leather strap and copper buckle, each bottle is also accompanied by a hand-signed and numbered certificate by the Bowmore Distillery Manager, Eddie MacAffer. From thrashing waves and Atlantic gusts to the purest water and finest peat, the ancient elements have also helped in shaping this Single Malt. 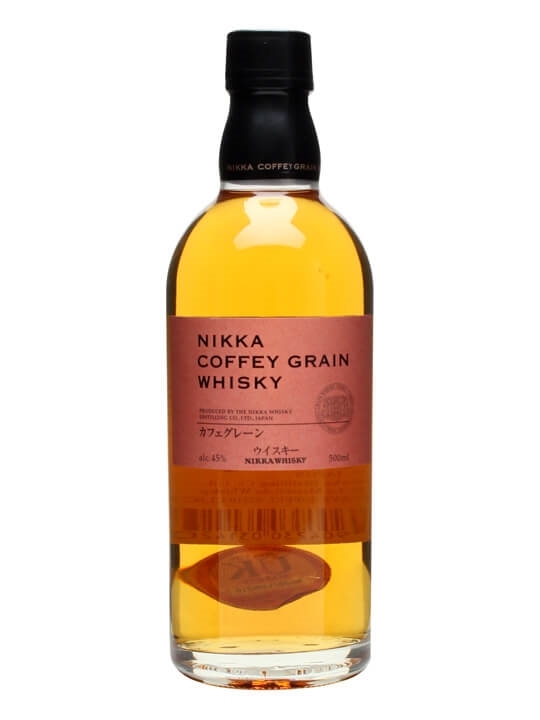 50cl / 45% – A release of grain whisky from Japan’s Nikka, produced mainly from corn using one of their continuous Coffey stills. Rather than the rare and limited releases they have done before, this is a larger release to further show off this key component in the Nikka family of whiskies.